Confira os destaques do centro histórico de Praga e outras atrações imperdíveis neste passeio a pé de 3 horas. Liderado por um guia especializado, passeie pela Praça da Cidade Velha e conheça as principais atrações de Praga, como a Praça Venceslau, o Bairro Judeu e a maravilhosa Ponte Carlos. Veja marcos menos conhecidos, como o Estates Theatre, onde Mozart apresentou "Don Giovanni"; aprenda sobre a longa e turbulenta história de Praga e desfrute de uma bebida incluída ao longo do caminho. Os números são limitados a 15 pessoas nesta turnê de grupo pequeno para garantir uma atmosfera mais íntima. 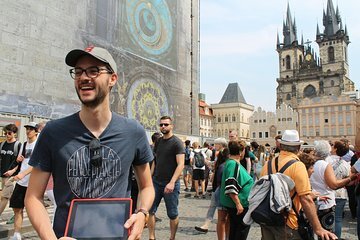 Comece sua excursão a pé em um pequeno grupo em um ponto de encontro no centro de Praga. Encontre seu guia e comece a explorar a capital da República Tcheca, com sua rica história de mil anos. Comece com um passeio pela atmosfera da Cidade Velha. Ao longo do caminho, ouça músicas intrigantes sobre o passado de Praga, incluindo os triunfos e tragédias que moldaram o destino da cidade através dos tempos. Veja a Capela de Belém, onde o herói nacional tcheco Jan Hus pregou no século XIV, e passe por outros marcos históricos enquanto se dirige à Praça Venceslau, uma das praças mais conhecidas de Praga. Veja a movimentada praça e ouça como ela presidiu dois dos eventos decisivos do país no século 20 - a Primavera de Praga de 1968 e a Revolução de Veludo de 1989 contra o domínio soviético. Veja a estátua do rei Venceslau que agiu como um ponto de encontro para os manifestantes, e aprenda sobre os tchecos que lutaram e morreram pela liberdade de seu país. Continue em frente ao Estates Theatre, onde Mozart deslumbrou os freqüentadores de ópera em 1787, quando conduziu a estréia de Don Giovanni, e viu a Charles University - uma das universidades mais antigas da Europa, fundada em 1348. Passe pela Praça da Cidade Velha para ver as casas de cor pastel, as igrejas e o Relógio Astronómico e reabasteça com uma bebida (por conta do visitante) antes de se dirigir ao Bairro Judeu. Aprenda sobre a longa e rica herança judaica de Praga enquanto explora e pare para ver o Antigo Cemitério Judaico e a Antiga Nova Sinagoga, a mais antiga sinagoga da Europa. Termine com vistas estelares de duas das atrações icônicas de Praga. Passeie pelo Rio Vltava e contemple o poderoso Castelo de Praga e a Ponte Carlos - uma visão de estátuas de pedra e arcos graciosos. Sua excursão termina no centro de Praga. I had an amazing time on this tour. My tour guide was amazing. She was very kind and informative. We even stopped for coffee along the way. Definitely recommend. Our guide Elena was excellent - very informative and very easy to talk to. We covered a really good amount of ground. Very informative and educational. Our guide was fantastic and we were the only ones that had booked that day so it need up being a private tour. This is one of the best tours I have taken. JohnHonza is the best tour guide I have ever had. Thorough and intelligent,well educated,he answered all my questions with detailed explanation including engineering and astrological questions about the clock. My only regret is not doing this tour the first day in Prague.Don't miss this tour! Very informative. This small group consisted of my wife, my self and the guide, Ondrej Bures. Could not praise Ondrej enough he is very knowledgeable and conducted the tour in a flexible way to suit our interests. Yes it was very interesting, we highly recommend it! Our guide was knowledgeable if not a little cynical of the history of his town. We covered a lot of areas and learned a lot about Prague. John Hounzaworked hard all morning to take our tour group of two all over the old quarter of Prague. He imparted the origins including political of Prague in a gentle and informative manner. He brought pictures to illustrate many of his interesting facts. After walking for some time he took us to a delightful cafe for coffee and continued our conversation there before continuing our walk. This was a wonderful opportunity to learn about the rich history and culture of a beautiful part of the world. John was generous was his time and talents. Our guide was very knowledgeable and informative. Listening to the history of Prague was intriguing. We highly recommend this tour. Amazing tour with an awesome guide. Jahn spelling?, our guide, provided so much history and information that made our visit so much more meaningful. We really came away with a better appreciation of the rich history and traditions of the Czech Republic and how that history shaped the Czech people. Our guide gave us so much insight about a place we knew little about. He took us to places we would likely not have seen or appreciated if we ventured out on our own, including his favorite coffee house that we returned to the next day. We highly recommend to take this tour early on in your visit and then use the knowledge you gain to explore some places in more detail. For example, our tour took us to the Jewish Quarter which we explored in more depth the next day. We would definitely return to Prague in the future.